very basic, regional and seasonal ingredients come together for a real taste explosion! the apple paste will become very sour and sticky. 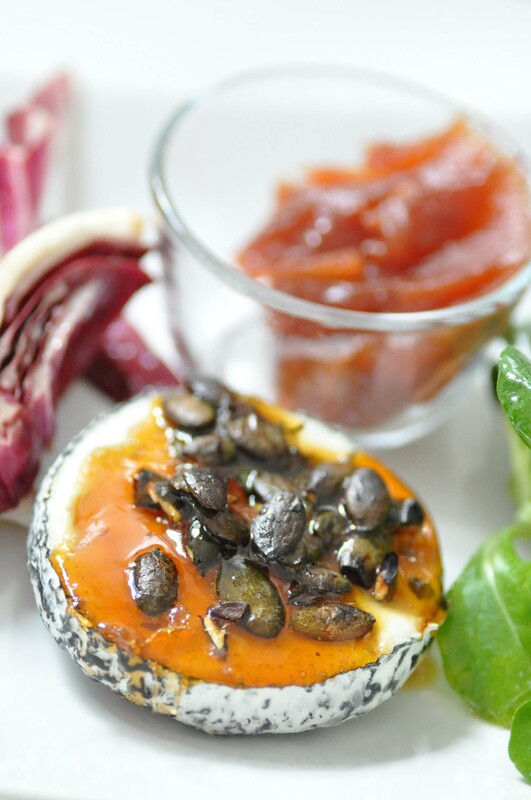 the grantinéed goats cheese soft and creamy, topped with crispy caramelized sugar and roasted pumpkin seeds. all in all a very harmonious combination of sweet and sour. to make the apple paste it does´nt matter if your apples are already a bit wrinkled. the gratinéed goats cheese and apple paste will be perfectly accompanied by whatever greens you currently have. thanks to the very mild winter (at least until last week), we had beside lamb´s lettuce also some radicchio. i loved the slightly bitter round off by the radicchio to the sweet and sour combination of the apple paste and the caramelized sugar. apple paste and gratinéed goats cheese with pumpkin seeds will be perfect as a starter or, if you make a bit more of it, as a light dinner. the recipe is from the german magazine essen&trinken spezial: die grosse urlaubsküche, which means holiday recipes. i think instead of summer, the time to enjoy apple paste is autumn when you harvest the first apples or winter if you still have some in your storage. preheat the oven to 180° C. quarter the apples and remove the core. pour the apples, lemon juice, white wine, sugar and chili in a large mixing bowl and blend. pour the apple sauce in a baking dish and bake at the lowest level of your oven for 2,5 to 3 hours. you have to stir from time to time while baking. allow to cool completely, which will last 3-4 hours. you can prepare it also a day in advance. pan fry the pumpkin seeds. remove the pumpkin seeds from the pan. add the sugar and allow to caramelize. add the pumpkin seeds again. spread the pumpkin caramel on a sheet of baking paper and allow to cool. combine the sherry vinegar, walnut oil, honey, salt, pepper and 3 tbsp of water to a dressing. wash the lettuce. preheat the oven to 180° C. slice or halve the goats cheese rolls and set in a baking dish. break the pumpkin caramel into pieces and set on top of each halved cheese. bake until the caramel become liquid again. combine the lettuce and the dressing. arrange on plates. place the gratinéed cheese on top and serve with some apple paste. den ofen auf 180°C vorheizen. die äpfel vierteln und das kerngehäuse entfernen. äpfel, zitronensaft, weißwein, zucker und chili in eine hohe schüssel geben und pürieren. das apfelmus in eine auflaufform geben und auf der untersten schiene des backofens 2,5 bis 3 stunden backen. die apfelpaste kann auch bereits einen tag im voraus vorbereitet werden. die kürbiskerne in einer pfanne anrösten. aus der pfanne herausnehmen. 100 g zucker in die pfanne geben und karamelisieren lassen. die kürbiskerne untermischen und das kürbiskernkaramel auf einem backpapier dünn ausstreichen. komplett erkalten lassen. sherry essig, walnussöl, honig, salz, pfeffer und 3 el wasser zu einem dressing vermischen. salat waschen. den ofen auf 180°C vorheizen. die ziegenkäserollen halbieren und in eine auflaufform setzen. das kürbiskernkaramel in stücke brechen und auf den käse legen. backen bis das karamel flüssig wird. salat und dressing mischen, auf tellern anrichten und den käse darauf setzen. mit apfelpaste servieren. This entry was posted in autumn, recipes, seasons, winter and tagged apple, lamb´s lettuce, radicchio by The Cook. Bookmark the permalink.